The main point I’d like to make in this piece is that Libertarians should not tolerate a moderate position on drug policy. Weed should be legal, but harder narcotics should be banned is a cowardly opinion for a lover of Liberty. 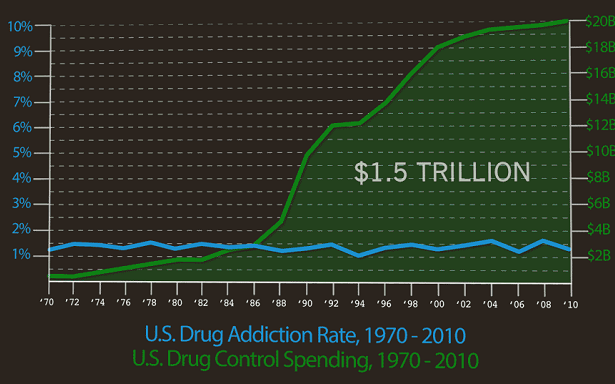 Drug use should be decriminalized, but the drug trade should not be legalized is weak as well. The only acceptable Libertarian drug policy is the total legalization of the manufacture, sale, and personal use of all substances. The reason I say Libertarians should vouch for legalization instead of decriminalization is because we live in a world of taxes and regulations, not a Randian utopia. Since basically every other industry is taxed and regulated, the drug industry ought to be too. Though decriminalization would be ideal, it would be unfair to leave one industry free from government interference and not others. The push to keep taxes and regulations at a minimum in the drug industry and all others is a separate battle. By practical Libertarianism, I mean the broad spectrum of ideas that are often described as socially liberal and fiscally conservative or Classically Liberal. Practical Libertarianism, by my definition, encompasses the likes of Steven Pinker, Jonathan Haidt, and Jordan Peterson as well as Ron Paul, Stefan Molyneux, and Ayn Rand (though not all of them would necessarily embrace my label or support total drug legalization). On the Progressive end, consider abortion. Every pro-choice advocate is ready to note that women will not cease from having abortions if they are forbidden, but will instead go to back-alley clinics where there is little concern for medical degrees or hygiene. Banning abortion will spread death and disease without actually banning abortion. The logic of each of these positions is accurate and sound, regardless of your feelings on firearm and reproductive rights. The same thinking should be applied to drug prohibition, which already provides glaring real-world illustrations that the naked eye can see: the underground drug industry is unimaginably violent, drug abuse is as rampant as ever before, the quality and content of the drugs being taken is a mystery to dealers and users, and people who could benefit from some guidance wind up hurting themselves and others every single day. Name a legally-operating industry that experiences these problems, and I’ll delete this column. The third point to make is that drug laws don’t stop people from doing drugs. I can prove this point from personal experience. For starters, I smoked pot regularly in high school and college and also experimented with psychedelics, cocaine, and opioids. The fact that these drugs were illegal for me to use made them easier for me to acquire than alcohol until I turned 21. Alcohol distributors that want to keep their licenses must follow the rules or lose a great source of revenue, so it took elaborate plans to fool them into selling booze to my friends and me. Drug dealers did not face this kind of dilemma, so all I needed to procure them was a contract and cash. A total drug legalization policy initiative could include some modest regulations. Perhaps age limits, manufacturing protocols, advertising restrictions, distributor licensing, and some other rules would have a positive impact without meaningfully impeding Liberty. But the general proposition of treating drugs like any other consumer product is supported by evidence and common sense, and Libertarians should promote it unapologetically. Those more confident in their political opinions tend to know less.